Oil paintings such as this with subjects taken from popular literature steadily replaced commissions for history paintings in the early 19th century. The public and most collectors of modern works started to prefer lighter and sometimes more sentimental themes. 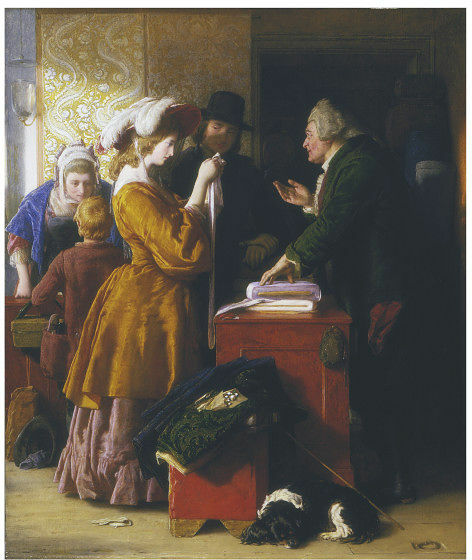 The subject is taken from the opening sentences of Oliver Goldsmith's novel 'The Vicar of Wakefield': 'I had scarce taken orders a year before I began to think seriously of matrimony, and chose my wife, as she did her wedding gown, not for a fine glossy surface, but for such qualities as would wear well.' Mulready had already provided a frontispiece for an 1843 edition of the novel - the composition on which this painting is based. It was exhibited at the Royal Academy in 1846 and was an immense success. John Sheepshanks (1787-1863), the industrialist and collector, owned many paintings with subjects taken from well-known authors, such as Shakespeare, Chaucer and Molière. He particularly admired the work of the artist Mulready, so much so, that he bought 31 of his paintings, often at very high prices. Oil on panel depicting a group portrait scene from Goldsmith's 'The Vicar of Wakefield'. 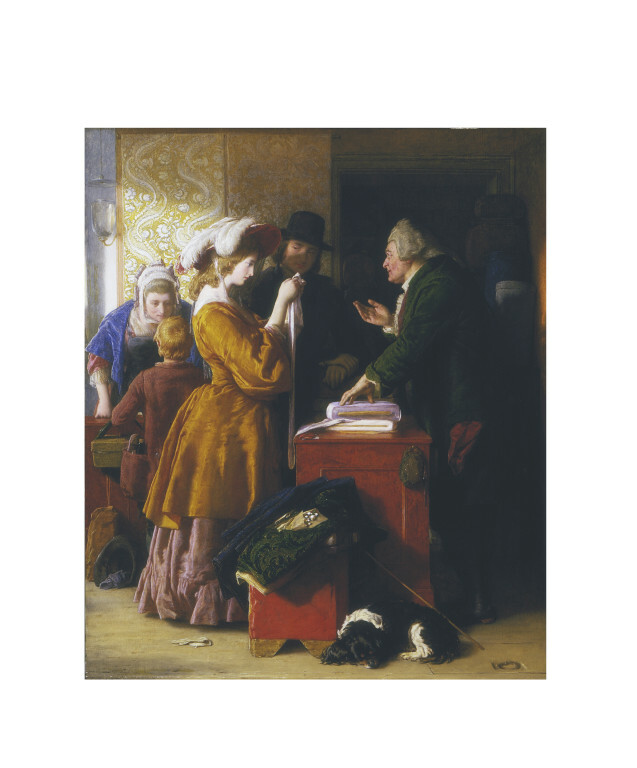 The bride-to-be is carefully inspecting the fabric from a roll on a counter, whilst the merchant on the other side attempts to persuade her of its quality. 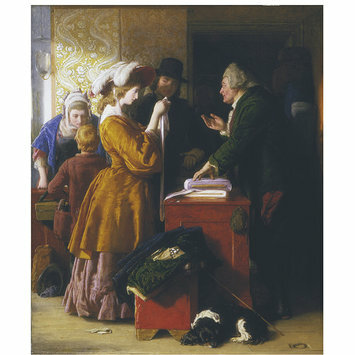 Oil painting by William Mulready entitled 'Choosing the Wedding Gown' (Goldsmith, 'The Vicar of Wakefield', Chapter 1). Great Britain, 1845.